BEIJING — The studio would have stood at the heart of an embryonic arts cluster on the outskirts of Shanghai, drawing luminaries from around the world. It took two years to build, and one day to tear down. 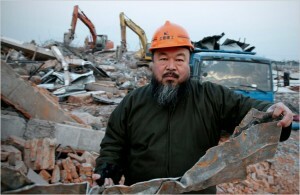 The new Shanghai studio designed by Ai Weiwei, a protean artist who is one of the most outspoken critics of the Chinese Communist Party, was completely Ray Ban outlet razed at the order of government officials on Tuesday, Mr. Ai said in a telephone interview from Shanghai on Wednesday. Mr. Ai said a neighboring studio he had designed for a friend had also been destroyed. “Everything is gone,” he said. “It’s all black now. They finished the job at 9 o’clock last night.” It is the latest act in Mr. Ai’s escalating conflict with government officials over the Communist Party’s authoritarian rule — a clash that Mr. Ai now views as performance art. Mr. Ai said he did not know why officials decided to destroy the studios, but suspects it was because of his political activities. Excerpted from a New York Times article by Edward Wong.